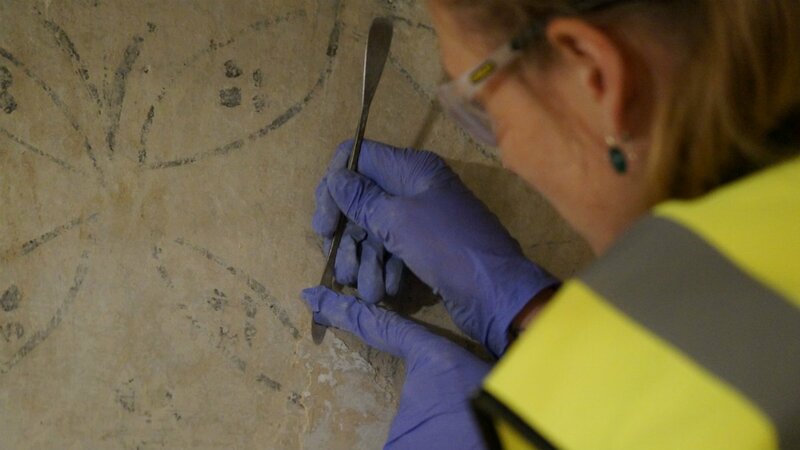 Conservators working on a £3 million restoration of Lindisfarne Castle in Northumberland have peeled back layers of later paint to find 17th century decorative painting in a floral motif. They were found in the kitchen and east bedroom, and while they are not well preserved (understandable given the building’s checkered past), curators believe they were originally part of a larger decorative motif spread throughout various parts of the building. Nick Lewis, the house steward of Lindisfarne Castle, said: “If you imagine a wallpaper in anyone’s house today, they often have flowers on the wall. Well, this is what this is, it’s decorative and was intended to make them feel happier and at home. “They used charcoal to draw it, very simple carbon, and there are areas of red pigment so they might have been painted and coloured. We know it was done professionally, so you didn’t just sit and do it yourself, and in those days there was a guild of wall painters who they would have used. 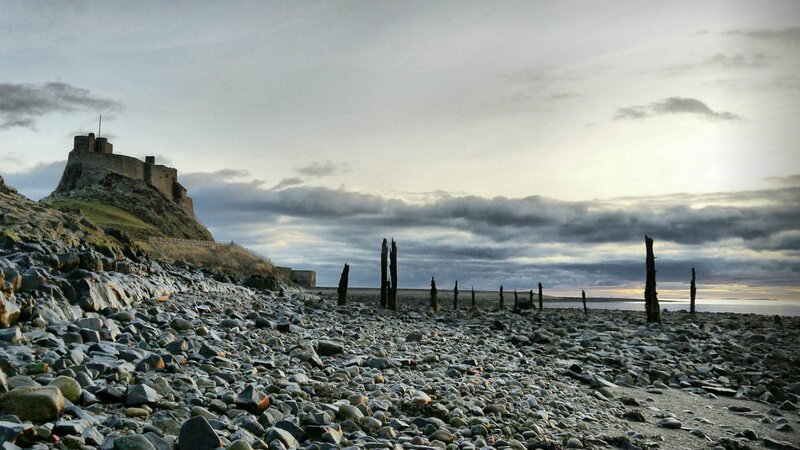 Lindisfarne Castle was built on a crag, the highest point of Northumberland’s Holy Island, in 1550 as a military fort. Stones from the Lindisfarne Priory, which had been suppressed by Henry VIII in 1539-40 and the ruins converted into naval stores, were used to build the defensive installation. It was rudimentary at best, not more much than a stone platform on an earthenwark bulkwark armed with a few cannon until the reign of Elizabeth I. She ordered that a proper masonry fort be constructed and armed in 1565. It continued to be garrisoned even when its strategic importance faded after the unification of the Scottish and England thrones under the James I, and it saw the only action of its long life when it was taken over by Scottish insurrectionists for a few days during the Jacobite Uprising of 1715. The crown withdrew the last of its soldiers and arms in 1893, and in the beginning of the 20th century it was reduced to an occasional coast guard lookout and a tourist attraction of mild interest. In 1901, it was acquired by publisher Edward Hudson who hired architect Edwin Lutyens to renovate it in the Arts and Crafts style, incongruous as that may seen for a stone fort atop a Northumbrian crag. Lutyens made major changes to the structure, rebuilding some of the oldest parts of the castle with new architectural elements — massive lintels, arches, brick floors, fireplaces — and erecting a tower where none had been before. The castle as it stands today is largely an Edwardian country home of distinctive originality, although many of the Tudor and Victorian features remain, integrated into a new unique whole greater than the sum of its parts. In 1944, Lindisfarne Castle was placed in the care of the National Trust. It was opened to visitors in the late 1960s has become a popular destination, averaging about 90,000 visitors a year. 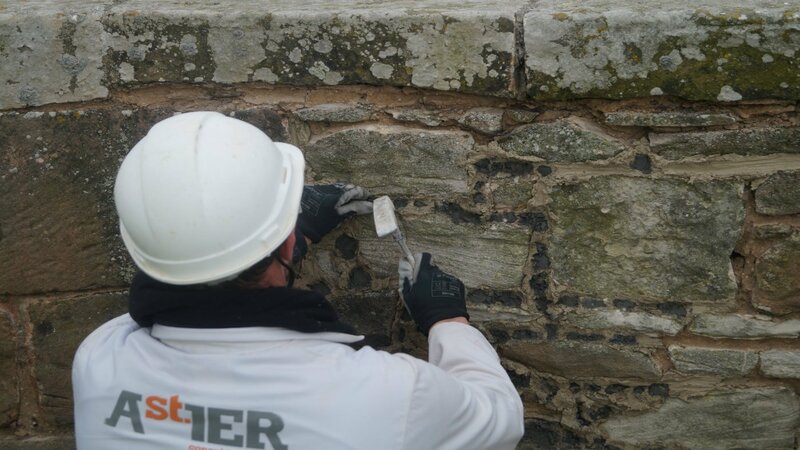 Maintenance on a multi-layered building overlooking the cold waters of the Northumberland coast is a challenge, however, and in late 2016, the National Trust undertook a major conservation project to fight back against the constant invasion of moisture that has caused significant damage to the stonework, mortar and windows. All of the interior work is now complete and the finishing touches on the exterior will be completed by May. The site reopens to the public of April 1st (not a joke), but the collection won’t be reinstalled until five weeks later. The first exhibition, Empty Spaces, will take the opportunity to showcase the story of the conservation project itself, as well as emphasizing the bones the castle’s architecture before they’re upstaged by furnishings, accessories and more than 1,000 other historical items in the collection. 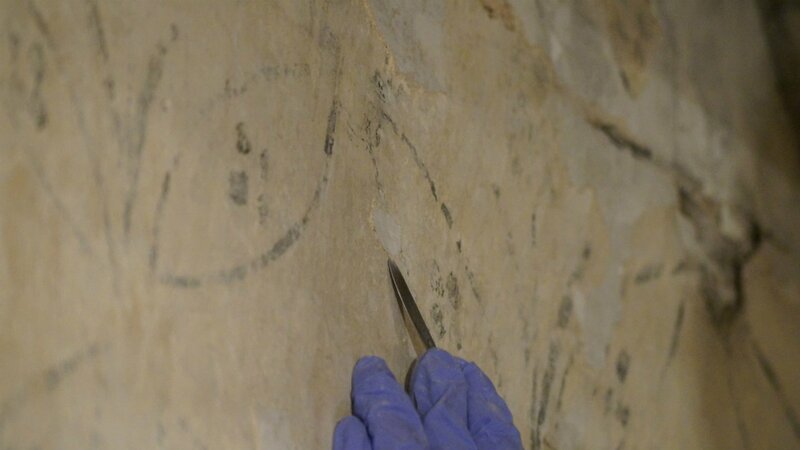 The newly-discovered wall paintings are also being stabilized and conserved so they can take their rightful place in the endlessly surprising and varied texture of Lindisfarne Castle history. The ones in the kitchen will be on display to the public when the castle reopens on April 1st. 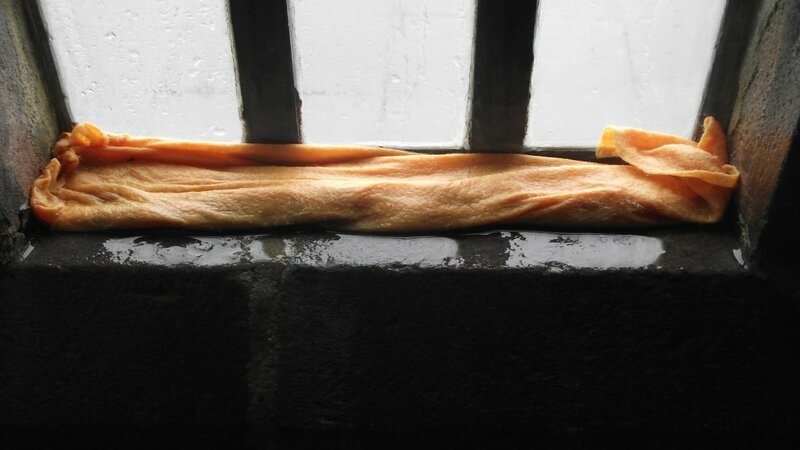 John Wynn-Griffiths, a conservator for the National Trust, said: “This is such an exciting and rare find. We are always extremely careful when peeling back layers of history but we did not expect to find these paintings at all. “The existence of interior decoration prior to Lutyens’ renovation of the castle adds a new dimension to its historic function. Based on our knowledge of the physical history of Lindisfarne Castle, it suggests that there might have been more to life at the castle than just a military base. This entry was posted on Sunday, March 25th, 2018 at 12:08 AM	and is filed under Modern(ish). You can follow any responses to this entry through the RSS 2.0 feed. You can skip to the end and leave a response. Pinging is currently not allowed. Lutyens would have been a good choice, although I am glad that I did not have to do any building work there.